The Chairman of the Volta and Eastern Branch the Association of Ghana Industry (AGI) says it is worrying that Ghana recently dropped in the World Economic Forum’s Global Competitiveness Report. Dela Gadzanku said it is unfortunate that Ivory Coast continues to overtake Ghana in the rankings. He wants businesses in the country to leverage on the peace, good governance and stable democracy that Ghana enjoys to attract foreign direct investments. Dela Gadzanku said this at a 2018 Budget Business Breakfast meeting organised by the AGI in Ho recently. The meeting was held to deliberate on issues about industry in the Volta and Eastern regions and also to discuss the 2018 budget statement. He advised the business community against allowing politicians to overshadow discussions on the budget every year, stressing “this must not continue”. 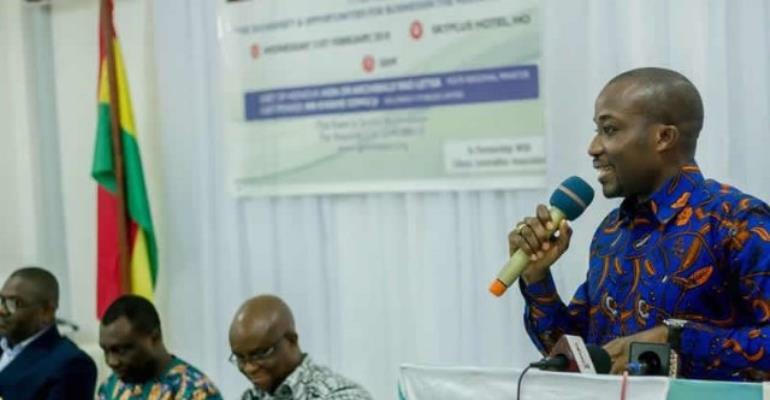 Dela Gadzanku revealed that at a recent retreat, the National Council of AGI agreed to establish the National Competitiveness Council which will comprise representatives from government, the private sector, and other stakeholders to serve as an advising board for the government on key issues stifling the growth of the industry. The guest speaker at the forum, Kwame Sowu Jr, an entrepreneur, said the business community must come together and engage with political and traditional leaders in order to take stock of the potentials in the two regions. Mr. Sowu Jr urged business owners to take advantage of the ECOWAS Trade Liberalization Scheme (ETLS) which came into force on January 1, 1990, with provisions for tariff reductions on unprocessed goods, handicraft and industrial products of community origin. The scheme, among other things, grants ECOWAS market access to manufactured or processed products made in the ECOWAS region without the payment of import duties or equivalent taxes. He said for the year 2017, 20 companies have been granted approval under ETLS as seen in the third quarter. It is expected that more approvals will be granted by the end of December 2017. “The implementation of the ETLS has, however, been fraught with many challenges including ineffective operationalization of the ETLS Protocol by member states, inadequate sensitisation of businesses on the ETLS, low compliance level, policy incoherence in member states, high number of physical barriers along the corridors, harassment of traders by some security agencies, trade controls policy instruments such as bans and quotas, institutional weakness and a lack of political will,” he said. The Volta Regional Minister, Dr. Archibald Letsa, who was the guest of honour encouraged business owners to take advantage of the many natural resources in the region. He said the government has laid a firm foundation for the development of industry by putting the necessary measures in place to help businesses. The Volta GJA Chairman, Kafui Kanyi, complained about churches taking over the once vibrant light industrial area. He appealed to political leaders and stakeholders to come onboard and help industries and companies in the Volta Region in order to bring employment to the youth. Kafui Kanyi also disclosed that the GJA has appointed a business economic advisor to guide the Association’s campaign to promote industrialisation.